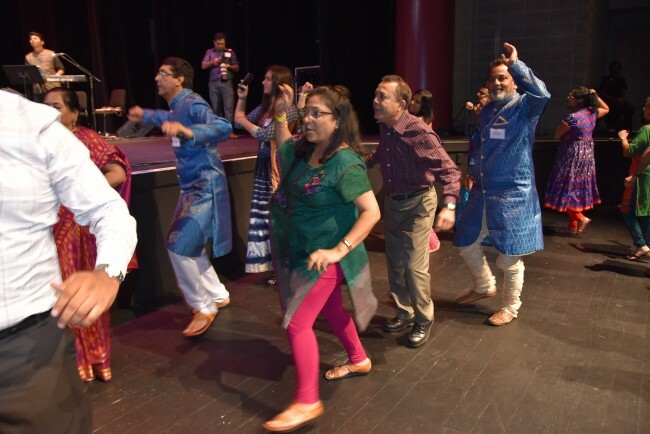 Atlanta, GA: OHMKARA presented ‘Gujarati Jalso 2017’, a historic, unforgettable, grand extravaganza of Gujarati culture at the Georgia Institute of Technology-Ferst Center for the Arts, Atlanta on Saturday August 12, 2017. The musical event was graced by Consul D.V. Singh and many other dignitaries from the Indian community. The Gujarati Jalso, a unique show, with panoramic breadth and appeal, named ‘Panchamrut’, is the brainchild of noted artist Parthiv Gohil, and is designed especially for the U.S.tour in 2017. It is an engrossing kaleidoscope of Sugam Sangeet, Lok Sangeet, music, poetry and short stories presented by renowned talented young and veteran singers, poets, musicians, and stage and TV artists. 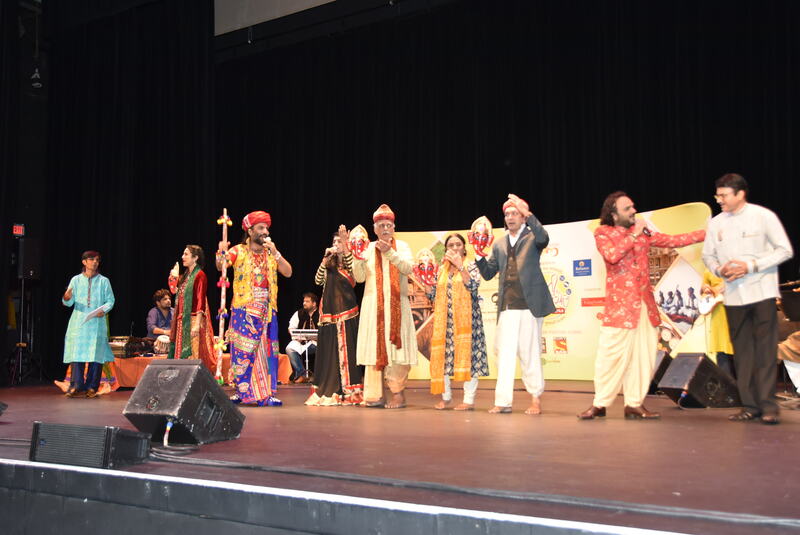 Prior to this OHMKara has organized highly successful musical concerts ‘Samanavay’ in 2014, Avinashi Avinash’ in 2015 and ‘Mor Bani Thangat Kare’in 2016, in 16 cities in nine States in the U.S. as well as Muscat, Oman and Dubai to promote Gujarati music and literature outside India. The ‘Gujarati Jalso’ is supported by Utpal Bhayani of Image Publications and Vile Parle Educational Trust. OHMKara’s team member Dr.Tushar Patel warmly welcomed all and gave a brief history of OHMKara, the current tour itinerary and introduction of the Gujarati Jalso. The show was emceed by poet Pranav Pandya who introduced each item with brief insights into Gujarati people, literature, music, etc., and peppered it with short poems and humor. The show began with Ganesh Vandana. Noted veteran TV,film and stage artist Utkarsh Mazumdar captivated the audience with his acting while Mazumdar’s flute-playing prowess as the audience was taken on a ride in Melas (fairs) through a couple of Mela songs by young ,proficient singers Gargi Vora and Jahnvi Shrimankar. The audience warmed up and began tapping their feet, clapping and singing a few lines of the songs. 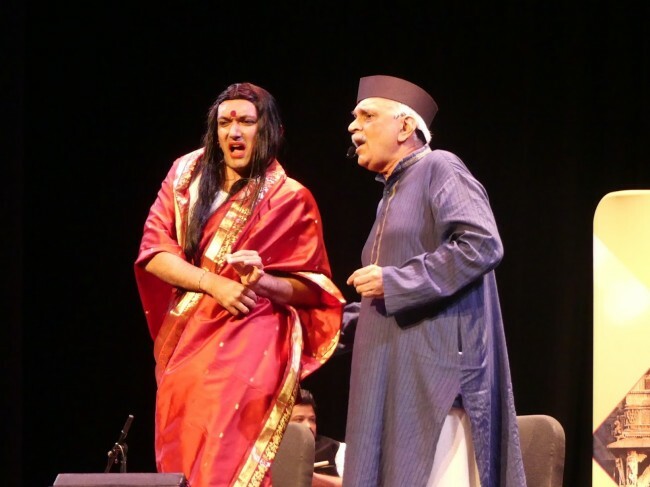 India’s only Gujarati play ‘Maro piya gayo Rangoon’, a Gujarati adaptation of Shakespeare’s play ‘All’s well that ends well ‘was chosen for the prestigious Globe to Globe Festival in London in 2014. A scene from that play was presented by thespian Utkarsh Mazumdar (Gokuldas), Chirag Vora (BharatRam) and Mansi Gohil (Heli).In the heart lifting scene Heli cures rich, cantankerous and sick Gokuldas with her medicines and for her reward gets permission to marry his son Chirag! Sairam Dave had the audience in stitches with his flurries of jokes in his inimitable style. The jokes based on a keen sense of observation and nuances of everyday life had the audience laughing out loud and applauding. After rib-tickling jokes it was time for romantic vintage songs in melodious voice by Gargi and Jahnvi. Songs ‘Chhanu re chhapnu’, Najarna jaam chhalkavine’,’and ‘Pandadu lilu ne rang rato’ got some of the spirited audience up for garba near the stage-floor. Pranav profusely thanked Sony TV, Shri H.R.Shah (TV Asia) and Dr.Sudhir and Dr.Sudha Parikh (Parikh Worldwide Media) for their tremendous and continuous support over the years to OHMKara. The Gujarati Literary Society of USA’s member Chirag Thakkar thanked Kalpesh Patel- Patel Bros.,SWAD, Bhupendra Darji, Kaushik Dave-K.B.Zaveree, Rajnibhai and Suhagben Parikh, Vaishnav Samaj of Atlanta, Madras Mantra, Kala Gurjari, Amit Shah- GCANA, Gujarati Literary Society of USA’s Mustafa Ajmeri, Jatin Shah, Nimish Sevak, Sanjay Pandya, Chirag Thakkar and their spouses. Chirag also thanked Anwar Ajmeri, Darshan Shah (Photography services), Iqbalbhai,Asish Patel, Sandeep Savla,Chaulaben Zaveri Shah, GA Tech for the Ferst Center and media: Atlantadunia, Khabar, NRI Pulse, RashtraDarpan, Divya Bhaskar and TV Asia. Consul D.V. Singh warmly greeted all and said that though his knowledge of Gujarati is poor, he was enjoying the Gujarati Jalso. He graciously inaugurated a souvenir with Mahatma Gandhiji’s postage stamps from different parts of the globe. Gujarat’s poet-saints are revered for enriching Gujarati literature and culture through ‘santvani’. Accompanied by heart touching flute playing by Mazumdar, rhythmic beat of the drums, Parthiv Gohil, Gargi and Jahnvi sang uplifting songs Ram Sabha ma ame ramvane gyata and Jesal Toral movie song Paap Taru Prakash Jadeja, and ‘Helo maro sambhalo’ elicited tumultuous applause. As Krishna Janmashtami is very near, and to convey the eternal and sublime between Radha and Krishna, Manasi Gohil sang upbeat ‘Radha dhoond rahi’and couple more Radha-Krishna songs. Noted poet and journalist Hiten Anandpara, who also emcees OHMKara presentations recited his interesting poems on Death and some more with Pranav Pandya, also a poet/teacher from Amreli. During the interval, all relished complimentary tea and snacks. Another hilarious skit was performed by Chirag Vora and Utkarsh Mazumdar. The live music added a sparkle to the melodious renditions of timeless Gujarati songs. The musical artistry of Rishin Saraiya- Tabla, Rahul Pawar – Drums/octapad and instrumentalists Abhinav Bora-Guitar, flautist Mazumdar, and Dharmesh Joshi on keyboard was magnificent. The fabulous musical treat ended on a high note with a rousing sing along of ever popular Jai Ho, Maa Tujhe Salaam and Vande Mataram songs. Gujarati Jalso troupe came on stage to take a bow amidst a standing ovation! Gujarati Jalso gave the audience a rare opportunity to savor the beauty of the quintessence of Gujarati Culture in Atlanta!